Right off the bat, let's say that the news that is to follow is extremely suspect, and nowhere near fact. As we all know, one of the easiest things in the world to fake is the info you find attached to benchmark tests (which is a major reason why we don't believe for a second that there's really a Sony device out there running Android 5.0). Still, there is a new device that has popped up that may be the $99 Nexus 7, specs and all. The info comes from GL Benchmark, and shows a tablet labeled as "ME172V", which is said to be an ASUS tablet. If this is really the Nexus 7 built to hit the $99 price point, it is listed as having a 1024 x 600 pixel resolution display, 1GHz processor, 1GB of RAM, 8GB of internal storage, and a 4270mAh battery. However, there are a couple odd things about the listing. First of all, the tablet is listed as running Android 4.1.1, which is a bit old for a Nexus device. It's not even the latest incremental 4.1 update, let alone 4.2 or 4.2.1. The second oddity is that the tablet is listed as having an SD card slot, which is something Google has been moving away from with recent Nexus releases. I have one and looks like I can get my wife off of mine with that $99 price point. Cha ching! I'm sure that will not happen, Asus would kill their own business if they do so. Where is there anything hinting at it being a Nexus tablet? There is nothing that directly insinuates Nexus, but ASUS only has two 7" tablets in its lineup, and the MeMo hasn't been seen in a while, so the likelihood is that it's a Nexus. But the SD card slot and "outdated" software suggest it isn't a Nexus. Which is why I said that we're extremely skeptical about this report. make sense..since there's no 8GB version now..so probably the past 8GB will be $99! Or... it's definitely not a Nexus device given the information that says it doesn't have 4.2 listed but does have an SD card lot listing. Google's trying to get away from SD card slots to spur use of Google Drive. I can't see Google taking a step back for the current Nexus 7 screen resolution of 1280 x 800 (is that correct?). More than likely to me this would be just an Asus branded tablet with vanilla Android... possibly an updated MeMo, as Michael mentioned in the commentary of not hearing about it in a while. I would think that it would make it more plausible to be a MeMo(-esque) tab than being a Nexus branded tab. Singel core is enough, if not using tablet for playing games and phones were using singel core before dual/quad released. Dont see why it isnt enough now, when it was enough before? Surfing, video, photos and apps using dont need dual/quad for it. If this is really going to be released for 99 dollars, I don't think most people who buy it will use google drive or any other cloud service so having an micro sd slot is not a bad option. If Asus are making this I just hope they price it properly in my country (Nexus 7 16 GB costs almost 400 US dollars in India). 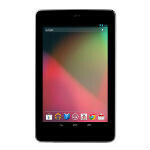 You get Nexus 7 32GB for $390 on ebay india. Ebay/Amazon does seem to be only option for us unless we have any friends/relatives at places where it is available through play store.